Schematic diagram of a handball playing field. Each goal has a circle clearance area of three meters in width and two meters in height. It must be securely bolted either to the floor or the wall behind. The goal posts and the crossbar must be made out of the same material (e.g., wood or aluminium) and feature a quadratic cross section with sides of 8 cm (3 in). The three sides of the beams visible from the playing field must be painted alternatively in two contrasting colors which both have to contrast against the background. The colors on both goals must be the same. Each goal must feature a net. This must be fastened in a such a way that a ball thrown into does not leave or pass the goal under normal circumstances. 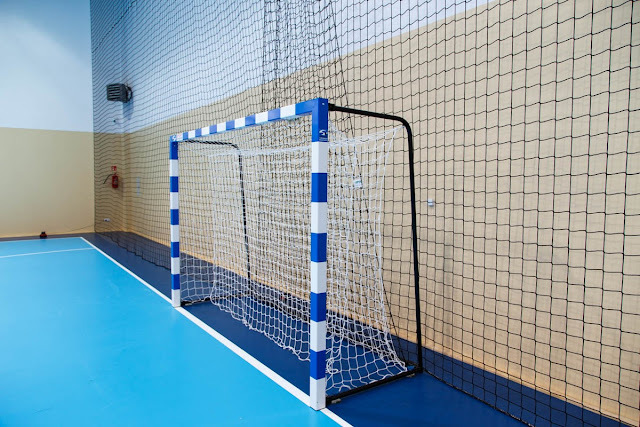 If necessary, a second net may be clasped to the back of the net on the inside.